Parenting is not easy, especially the first time around. From sleepless nights to endless diaper changes, there is so much to learn in the first few weeks of taking care of a newborn. This week marks six weeks for our sweet little Eli. (Read his birth story here.) It's hard to believe that we brought him home that long along and have successfully navigated the first month and a half. It's been a sweet time, but the newborn days definitely have their ups and downs. Here are ten tips for surviving, and even thriving during the first six weeks with a baby. One of the biggest keys to survival in the first six weeks is simply to recognize that you are learning, and to not be too hard on yourself (even if this isn't your first baby). This is a time where you'll be stretched beyond belief, not to mention hormonal, so it's totally okay and normal to cry and or feel overwhelmed. Even in the moments where you feel frustrated, don't let yourself believe that you are a failure. Don't get caught up in worrying about schedules or having the perfect baby. Recognize that you're an awesome mama who is totally rocking it, even when it doesn't always feel that way. 2. Give yourself a break. Taking care of a new baby can be daunting, and you can only listen to so much crying before you just need a break. Even if it's walking outside to grab the mail, take a few seconds to yourself to catch your breath. It won't hurt your baby to cry for a few minutes. If you've got someone else around to watch your little one, hop in the car and go grab some coffee or get your nails done. I did this when Eli was eight days old and it made me feel like a regular person, not just a spit-up covered mom. Taking a break keeps you from getting frustrated and exploding, and it also helps you feel refreshed and ready to love on your baby again. 3. Be honest. Don't worry about people-pleasing. There will be so many visitors who will want to come and see your new little bundle, which is awesome. At the same time, you've got to be honest with them about the needs of you and your baby. If it's not a good time for visitors because you're in the middle of a feeding or you haven't slept at all, let them know. Find a time that works better and allow yourself to ask for flexibility. If you're feeling upset, overwhelmed, or just need a break, tell someone. 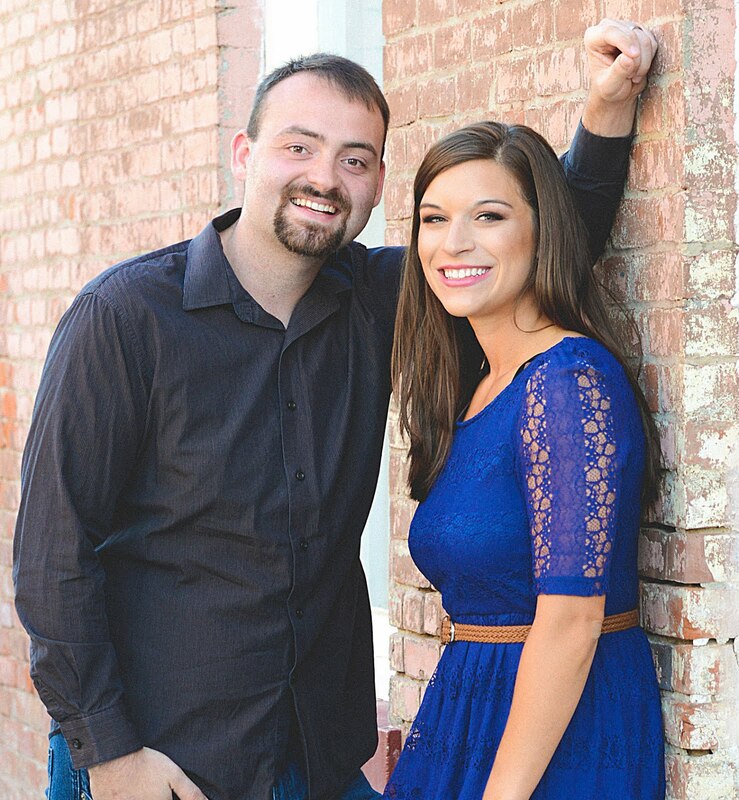 Be real with your spouse, yourself, and your friends. Don't let yourself get caught up in making others happy, and protect your need to heal and navigate this new, difficult time with your baby. People will have lots of time to love on them when you're up to it. 4. Find your village and say yes to their help. This is a time when you'll need your friends and family more than ever. When they offer to come sit with the baby so that you can nap or run errands, say yes. When they offer to cook a meal, say yes. When they offer to watch your little one so that you and Daddy can have a date night, say yes. Other moms have been there before and know what it's like. Don't try to be supermom all on your own or feel bad about taking them up on their offer to help. You're not an inconvenience. 5. When in doubt, ask other moms. Support and advice from other moms is huge. Although your baby is unique and what works for others may not work for you, it doesn't hurt to seek out knowledge from other experienced mamas. I've already found myself talking to my own mom about everything from nightly sleeping to if certain things are "normal" for a little one. Another mom helped me realize the need to "tuck" my little guy in his diaper so that he peed down into it instead of through all of his outfits. If you're not sure about something, ask. There is no question too silly. 6. Be prepared for lots and lots of bodily fluids. My goodness, can these little ones ever generate a whole lot of laundry! Of course, you've got to worry about diapers and all that fills them (especially if you've got a little boy who may bless you with a little fountain during changes). But on top of that, newborns spit up a LOT. Those with reflex spit up even more. At first this really worried me, but it's super normal when babies are little. Have burp cloths and bibs handy all of the time, and I wouldn't wear something that you aren't comfortable getting spit up on. We put bibs on over outfits so that we aren't changing outfits as frequently, and they can be really handy for preventing messy car seats. Check out Eli's gender neutral nursery! 7. Sleep when you can. I heard "sleep when the baby sleeps" again and again during pregnancy, and I can totally see why people say it. But for me, there were times when I wanted to throw in a load of laundry or walk on the treadmill or just feel human when the baby sleeps. So I'd slightly tweak the statement to "sleep when you can". Sometimes this will definitely mean sleeping while the baby is snoozing during the day. But other times, it may mean going to bed at 8:30 so that you can catch some sleep before the first nightly feeding. It may mean giving your hubby the baby for a while so that you can nap. Or it may mean "sleeping in" until 1 pm because your little one didn't go to sleep until 5 am. But definitely find time to catch some sleep every now and then, because you'll be getting much less sleep than you're used to. Hang in there! 8. Eliminate some things or let them wait until later. Because so much of your time will be devoted to loving on your new little one, there will be certain things that will either need to be put on hold for a while or possibly eliminated. I love keeping a neat house with things in their place, but in the first few weeks I had to let dishes and laundry sit for longer than I was used to. Of course I'm off on maternity leave, so I'm not working right now, but I also had to take more of a break from blogging, leading worship, and going out later in the evening because of our new baby. This doesn't mean that these things will never happen again, but rather that they aren't as pivotal right now as taking care of our baby. 9. Get out of the house with your baby. 10. Remember that this time is short, and cherish it. I really wish someone would have told me that the first night home from the hospital is the hardest. We had been basking in the joy of Eli's birth (and shipping him off to the nursery at night), so when he didn't sleep at all until 5 am the first night we were wondering what we had gotten ourselves into. But it gets easier. Even at six weeks, we think we're all starting to figure each other out and get into more of a predictable routine. And it's going fast. So even when it's frustrating, or overwhelming, or seems like an endless cycle of feeding, crying, and diaper changes, hang in there. Stop to marvel at your baby's smell, how peaceful they are when they (finally) sleep, and how little they are. Because someday soon they won't want to be held or snuggled or read to. Hang in there. Parenting is the best, hardest job ever, but it's totally worth it. You got this! 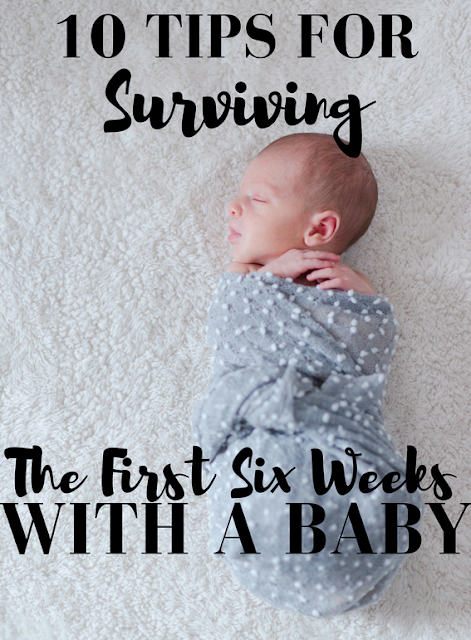 What helped you survive the first six weeks with your baby? Comment below or on the Facebook page. Be sure to follow along on Instagram if you aren't yet! These are awesome tips (especially the "tuck")! I love that you changed "sleep when the baby sleeps"; I always hated that one because, like you, sometimes I just wanted eat, or shower, or even sit and do absolutely nothing. And now our babies are SO big!!! I love it, Kelsie! You are doing so good with baby Eli! :) I'll definitely remember to give myself grace! Even in the hard times in pregnancy, I've told myself that it's just for a season, so hopefully I can do the same once she's born! Thanks, friend! And now you're on your second one!! I definitely agree with last one, Kelsie. You can't get this time back. I'm so happy to see that you and Eli are doing well! Have an awesome week! Those first few weeks can be just so tough... these are such great tips!! Thank you so much! That was my goal!